There are plenty of reasons why you will find coconut oil in many homes. It is said to be minimally-processed and has many heart healthy benefits, and coconut oil is becoming a favored alternative to many other cooking oils in the kitchen. When switching to coconut oil for cooking, you'll want to know all the facts first. This article will cover all you need to know about coconut oil and the best ways to use it. Is Coconut Oil Good for Cooking? Generally, coconut oil is a real good choice when used for cooking. In populations around the world, the Tokelauans and Kitavans are much healthier than those who eat less coconut oil. These populations eat a high quantity of coconut and have almost no reports of cardiovascular disease. Compared to the Western population, those who consumed more coconut oil were considered to be in much better health. Unlike most cooking oils, coconut oil is composed of unique fatty acids with nearly 90% of them being saturated. This means when you are using coconut oil for cooking, it retains most of its healthy properties since it is able to be heated at much higher temperature without healthy components being destroyed. The fatty acids can be quickly turned into energy for the body to use since it makes its way straight to the digestive tract. Coconut oil has an abundance of lauric acid which can help increase HDL levels, the healthy cholesterol in your body. This type of fatty acid is beneficial for other reasons as well. It can kill harmful bacteria, fungi, microbes and viruses in the body. Coconut oil has been shown to reduce the LDL cholesterol in the body and can be highly beneficial on blood coagulation and antioxidants. This can result in a lower risk of heart disease which most other oils will have the opposite effect. The medium chain triglycerides in coconut oil can help you lose weight. This is because they can increase the energy used by the body, curb your appetite, and promote healthy weight loss. Once coconut oil is consumed, it is often turned into ketones in the liver. This is what the body uses to provide energy to the brain which can help those who suffer from epilepsy. Coconut oil is also great for the skin and hair when applied directly to these areas. However, coconut oil wasn't always considered good for you. Refined and hydrogenated coconut oil is not healthy for you since it contains a high amount of trans fats, but unrefined, organic and virgin coconut oil does not have the same negative health effects. When coconut oil is left at room temperature, it remains in a solid state; once the temperature reaches 76 degrees, the oil will begin to melt and turn into a liquid state. If notice your coconut oil has begun to turn to a liquid state, this is not a cause for concern and you can still use the coconut oil when cooking. It will return to a solid state if you put it in the refrigerator or once the temperature drops. The high smoking point of coconut oil makes it ideal to use for almost any type of cooking. When you first use coconut oil to cook with, keep in mind these tips. To make it easier to measure, you can melt the coconut oil and then use ice cube trays to portion out the oil. Refrigerate them until it becomes solid again, then transfer them from the ice cube tray to an airtight container and keep them in the refrigerator. You can easily melt your coconut oil over low heat in a sauce pan. Since it begins to turn into a liquid at 76 degrees, this is done fairly quickly. Keeping your coconut oil on the stove will make it easy to access and the heat from the stove will often keep it liquefied and easier to measure when cooking or baking. Whipping up coconut oil is an easy process you can do and then store the whipped coconut oil in the bathroom to use as a moisturizer. 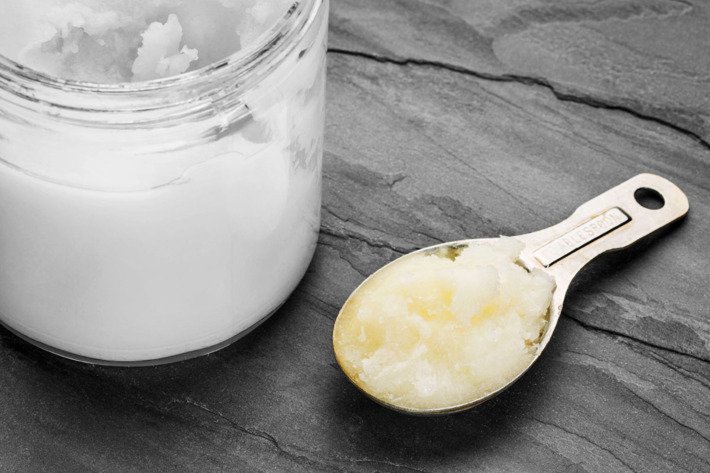 Coconut oil can be a great alternative to other oils, butter, and shortening. Keep in mind that if you add melted coconut oil to cold ingredients like milk or eggs, it will solidify again. To reduce this risk, keep all ingredients at room temperature before mixing in the coconut oil. Virgin coconut oil is the best option for cooking, but you can find expeller pressed coconut oil that has a milder taste. If you choose refined coconut oil, be sure no chemical solvents have been used in eh pressing process. Coconut oil for cooking has a number of benefits and after knowing a few tips to use coconut oil when cooking, you’ll want to learn just how you can incorporate it into your meals. Coconut oil can be used to replace butter in almost all dishes that require baking. Use the coconut oil in the same way you would use the butter in the recipe, either melted, room temperature or cold. You can also use coconut oil for pan frying many foods. Just as you would with any other oil, be sure to allow the oil to preheat to around 350 degrees. Use coconut oil to make scrambled eggs or melt it and pour over poached eggs. Use it to saute vegetables, and to cook lentils or beans. Use coconut oil as a base rub on chicken before seasoning.